Dr. Nicholas Sgaglione works in both private practice and clinical research on Long Island, New York. He is the head of the Orthopaedic Sports Medicine Division and Senior Assistant Attending Surgeon at North Shore University Hospital in Manhasset, New York. Dr. Sgaglione is a clinical consultant with Smith & Nephew Endoscopy and has helped since early 2000 with the development of an all-arthroscopic, suture-based meniscal repair system called FasT–Fix. Knee1: Where are you focusing your current research work? Dr. Sgaglione: It includes mostly clinical studies, follow-up surgery outcomes involving mostly (the) knee and shoulder. That would include work that is published on the ACL and rotator cuff surgery in the shoulder and most recently articular cartilage (the substance which covers the bones making up the knee as well as other joints that articulate.) resurfacing in the knee and meniscus repair in the knee. I have several studies that I am part of that include the use of genetic transduction of bone morphogenic protein to be able to then amplify the growth of chondrocytes that then can be used to resurface defects in the knee. That is something that's being done on a basic science levels in a large animal model in the research lab, and I will be one of the clinical investigators for the technique. Knee1: What prompted that research and what outcomes are you looking for? Dr. Sgaglione: The interest came about over the last five years in which I was involved in teaching and studying articular cartilage resurfacing techniques which include osteochondral autograft transfers (bone transfer), microfracture (a drilling technique) and autologous cartilage (Carticel) procedures. With these particular techniques, it's very promising and exciting but there are a number of limitations that exist. It (became) more clear that something else had to evolve to make what we have currently better and more effective. What we're looking for (is) a solution to resurface the articular cartilage lesions and defects in order to try to change the natural history of those defects to go on to osteoarthritis. That's a lofty goal. The second goal is to change, in the short term, the symptomatic problems that occur. These patients can develop significant dysfunction from these lesions. What can we do to fill the hole to be able to get them back and be active? The challenge is treating these lesions in the athletic population. What is becoming so important about this work and why it is so timely is that the average age of our athletic population is increasing dramatically. We have seen a fitness explosion over the last 20 years that will continue to expand over the next 20-30 years. Lifespans will increase, and the geriatric population will increase. The babyboomer generation is moving into that segment. As they say in orthopedics, we will someday have a cure for cancer but somebody will always fall down the stairs and break their arm OR TWIST THEIR KNEE. So there's this INCREASE in not only injuries but demand on the part of these people to be normal. Knee1: These bone defects, are they caused by injuries or genetics? Dr. Sgaglione: There are two types, and it is important to differentiate them. You have the traumatic cases. The 19-year-old snowboarder (for example) who blows out his ACL and gets a chunk of articular cartilage with a piece of bone flipped off like a piece of broken tile, if you will, is very different in terms of pathology from the older person with arthritis. So what happens is you have traumatic defects, and that's one whole category compared to the "wear and tear," early arthritic lesions. These categories are so different, and if you lump them together, you are going to make mistakes when selecting patients for surgery. You would prefer not to muddy the waters in terms of valid data analysis. The problem arises in that it’s not easy to be sure where the 42-year-old who blows out his knee on the basketball court and has an articular cartilage lesion fits in. Does that patient have a prior early arthritic lesion or a traumatic one? Is that a broken tile or has that been there for a while, and you just happen to see it and it's a worn tile? Then you have what's called Osteochondritis Dissecans (OCD). That's a case that we fully-don't understand the etiology. Some people say it is traumatic in origin. Some people say it's vascular in origin. Some people say it is some genetic architectural abnormality of the bone that then is mediated by trauma. As you break these down into three different types of problems, and then you subdivide the problems out, you have a variable presentation across the population that nobody fully understands. So if you treat all of these things equally, you are making mistakes because you are reducing the precision of the treatment and your ability to interpret outcome. You get into the variables that change the picture. Knee1: Can a bone defect occur only in the knee? Dr. Sgaglione: It occurs in all joints, the knee as well as in the shoulder, the ankle and the elbow. 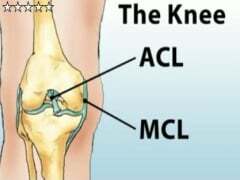 It occurs in the knee more than in any other area because the knee is the most frequently injured joint in the body. Secondly, the knee, in contrast to a lot of these other joints, is not A congruent architectural structure, meaning it is not a ball and socket that is well contained. It doesn't have a lot of muscle cover. It is inherently unstable. Knee1: We are in the middle of ski season. What can skiers do to keep healthy? Dr. Sgaglione: The three most important for preventative measures for skiing (are) number one: conditioning. Pre-season conditioning is important, mostly importantly hip, low back and hamstring tone. Since the ACL is your most-feared injury, the major agonist to the ACL (meaning it helps the ACL) is having good strong hamstrings. The best way to do hamstring strengthening is hamstring curls, but if you do nothing else, biking is probably the best exercise. (Work) on a Stairmaster in a position of flexion can be helpful . If you think about when you are skiing … you're going to tend to ski with your knees bent a little bit, with your hips bent a little bit and with your weight centered over the skis so you are a bit forward over the skies. Not forward in terms of your center of weight, but your body will be leaning a little bit forward. On the stair climber, get into that position. You will feel thigh burn when you do it, and you'll get a tremendous amount of benefit from that because it is a bit more sports-specific. And I would do a complete balanced program, including work on your triceps. Number two is to have your equipment – most importantly your bindings – tuned up and checked. If you (rent or demo), be sure that you test your bindings and make sure they release when you want them to release, not when the tech wants them to release. That's probably the biggest thing … (that) they don’t release or they release to soon, and that's when (you) get hurt. So pay attention to the equipment. And the third thing is to just be smart and have common sense. Know when to ski, what to ski, what your limitations are, not to ski fatigued, make sure you adjust to skiing in soft snow versus hard packed and just adjust to the conditions and ski within your means. That's really it. There is absolutely no indication or studies that show prophylactic knee bracing makes a difference at all. So nobody should be spending money for prophylactic bracing. It probably won’t make a difference. I think that orthopedics and the approach to sports medicine both in non-surgical treatment approach as well as the technical, surgical approach is just a very exciting field to be in. It is very gratifying to deal with this type of patient and to make a difference in terms of getting these people back to increased activity. And, it’s really fun! It’s a field that's very rewarding. The best thing in life is to be doing something in which you like what you do. There's a lot of gratification. Patients get better, and people can relate to that. And technically, it’s constantly changing. One very good example is articular cartilage. In the next 5 to 10 years you're going to see this dramatic series of advancements that you can implement and be a part of.